By now I am sure you have heard of the Beyond Burger, produced by Beyond Meat, seeing as the whole plant-based world is going bananas for it! On its packaging it claims to be, 'A new breed of burger - Made from plants. 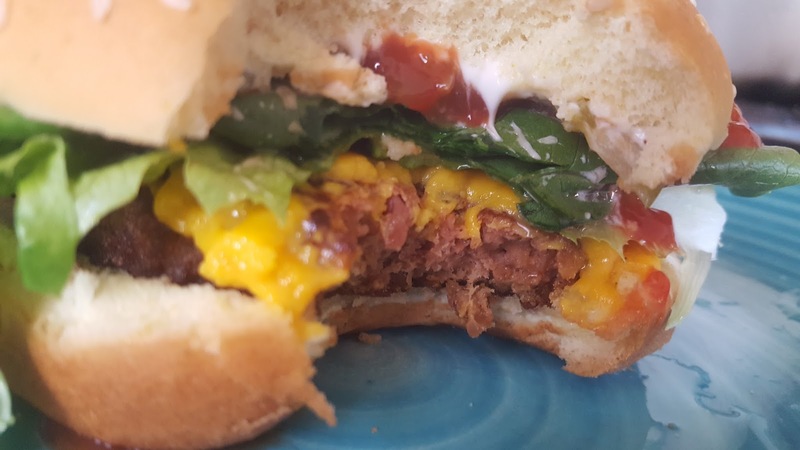 The Beyond Burger is juicy, meaty and delicious; offering all the upsides of a plant-based meal'. It is advertised to be so like beef patties that they are carried in the meat section of the grocery store! I set out to find out. First I had to find where they were even being sold. 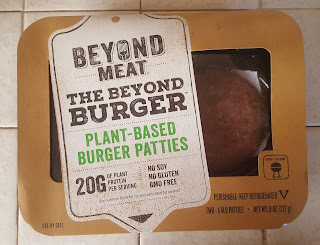 Using the store locator conveniently on Beyond Meat's website I quickly learned there weren't any in my area; so far only 3000 stores in the United States even carry them! Luckily I found the patties on a trip to visit my family in the bay area, wrapped them in ice, and headed back home to prepare them. Now the patties were not an exact match to the physical appearance of raw ground beef, but they were pretty darn close. Although I am here to test the taste and texture of this new version of a veggie patty; so armed with a skillet I set to work! Once set on the pan they began to sizzle much like a beef patty would. You could see some "fat" leak out of it if you pushed it with the spatula, although that would have just been the coconut oil it is made with - more on that later. There were many bold claims that it smelled like beef while it cooked, and maybe it was just my batch, but the patty had absolutely NO SMELL. I was slightly disappointed; I wanted all the science that went into this patty to include a beefy aroma. Nevertheless we continued on to the taste test! I prepared my burger with Daiya cheddar cheese, vegan mayonnaise, ketchup, relish and lettuce. My meat-eating boyfriend topped his with Daiya cheddar cheese, vegan mayonnaise, ketchup, tomatoes and lettuce. Not a huge difference, but thought I should let you know anyways...for the integrity of the testing! Now as you can see in the photo above the exterior of the patty does not look exactly like a beef patty, but it looks close enough that if I was just glancing at it, I would think it was real. But what about the interior and the taste? Does it "bleed" like people claim? Once I bit into it I could see that it was indeed pink inside, like Beyond Meat claimed. The texture looked and felt like a beef patty, feeling a bit springy as I chewed. I would not said it "bled", but it was kind of a trip to be looking at a pink veggie patty. Now as far as taste...here is what my meat eating boyfriend had to say, "I would say as far as ground beef it was up there. It didn't taste like super high quality meat, but if I didn't know any better I would have just thought it was real with some extra seasonings with it". He continued to moan while eating it, randomly exclaiming that it was "so good". I also thought it was really good, though from memory I did not think it tasted exactly like beef, although what do I know, I haven't had a burger in over a year. Personally I think if you have gotten used to your veggie patties and don't crave meat anymore...you probably won't have your socks blown off by this product. I still suggest it though! After all it took them seven years to make it, so trying it is the least we can do. So what did it cost? I spent about $5.99 on just two patties, which can add up to a lot if you are planning on feeding a whole hoard of people. What is it made of? The patties are mostly comprised of pea protein, coconut oil and yeast extract. Although there are other ingredients that are added to make up the textures and appearance - for example: beet juice is used to make the patty pink! 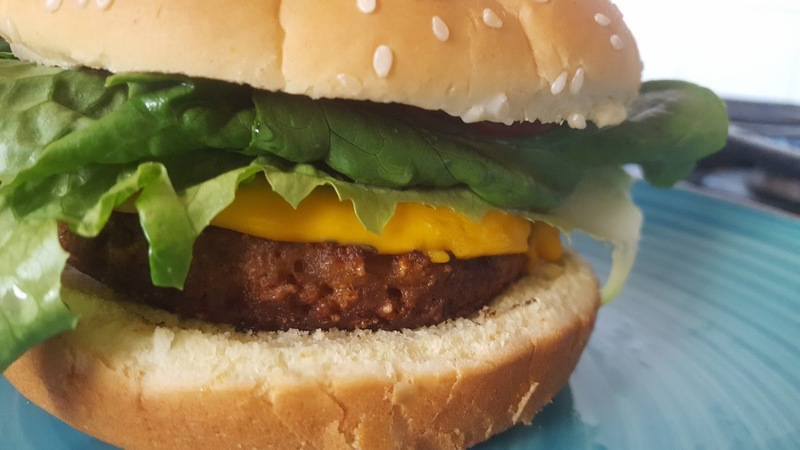 Beyond Meat boasts that they are 100% vegan and GMO, soy and gluten free. How does it compare to beef nutritionally? A quarter pound beef patty has 19 grams of protein, 80 milligrams of cholesterol, and 287 calories. A quarter pound Beyond Beef patty has 20 grams protein, 0 cholesterol, and 290 calories. Obviously the huge difference there being the lack of cholesterol in the Beyond Beef, and considering how many of Americans have high cholesterol, we should all be jumping for joy. We have found something to recreate one of our favorite meals, even if it still should not be eaten at every meal. 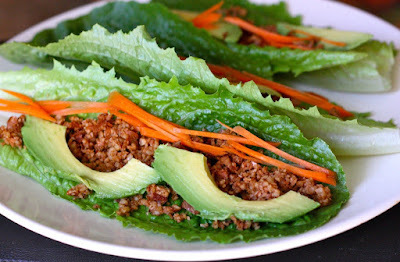 Overall, I will suggest this to everyone - veggie or omni's alike! Wow, that totally looks delicious. I am so glad there are alternative to what we used to eat so we will be healthier!